Is it possible to have a compact luxury crossover that still holds up to the rigors of an active family life? 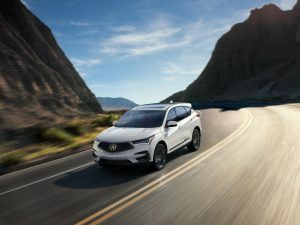 At Valencia Acura, the answer is a resounding “YES!” Meet Acura’s all-important, all-new 2019 RDX that promises zesty performance and plenty of technology, according to Business Insider’s glowing review. And it’s good timing for the RDX to hit the market now that SUVs have unseated sedans as the world’s go-to premium choice. The reimagined five-passenger RDX delivers top-of-class performance, a more spacious and luxurious cabin, and a host of premium technology and features. Its cargo space is now a considerable 30 cubic feet. Designed, developed, and manufactured in America, the new turbocharged RDX is the quickest, best handling and most luxurious RDX yet. Centered around the manufacturer’s Precision Crafted Performance brand direction, the 2019 RDX’s sumptuously appointed, tech-forward and spacious new cabin features Acura’s latest thinking surrounding a more premium, personal, and connected driving experience. If you’re not already an Acura enthusiast, perhaps now is the time to discover the price-to-quality ratio of the Acura brand that is hard to beat in the luxury space.